Even though parsley is in season all year round, I declare it to be my personal spring herb. I find its tart flavor very fresh and invigorating, just what you need after a long sleepy winter. In Mark Bittmann’s ‘How to Cook Everything”, I found a recipe of parsley pesto (which I didn’t use). However, he suggests the combination of mushrooms with parsley pesto. And that was the birth of this flavorful light dish. I decided to freshen up the parsley pesto with some lemon. I browned mushrooms in a little olive oil, coated them with the pesto and spread another spoonful over some spaghetti. A lovely vegetarian meal, good for lunch or a quick dinner. For the parsley lemon pesto, combine all ingredients in a food processor and blend until it becomes a fine paste. Add more olive oil if it seems to dry or crumbly. Season with salt. Cook spaghetti according to instructions. Drain the spaghetti. In a pan, heat one tablespoon of olive oil over medium heat. Brown the sliced mushrooms for about 5-7 minutes. They should keep a bit of a bite to it. 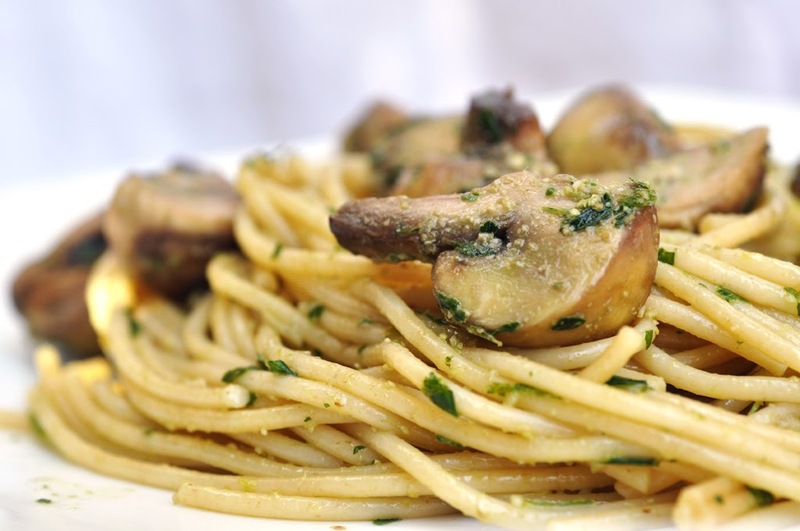 Toss mushrooms and pesto into the spaghetti. Transfer to plates and serve immediately.